Quality and Comfort + Peace and Quiet = Rest and Relaxation All this can be found at this beautiful self-catering accommodation in the heart of the North York Moors National Park, just 3 miles from the historic port of Whitby and the Heritage Coast.. 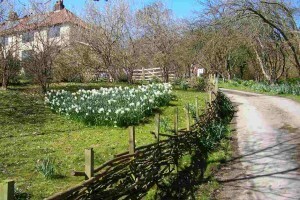 Please browse this site to find out more about the cottage: its location in North Yorkshire, when it’s next available, how much it costs and how to get in touch. There are also many pictures of the cottage, its garden and woods in our gallery pages and a frequently updated visitors book and a news blog page, sharing latest news about the cottage, the surrounding area and its wildlife. Full gas central heating throughout and flame-effect gas fire in sitting room. Large sunny garden with conservatory, decking, patio, barbecue, table and chairs. Freesat TV / DVD. Free WiFi. Off street parking (well within the garden) for 3 cars. For over 10 years Groves Dyke Holiday Cottage was Yorkshire Tourist Board inspected – 3 Stars and given the English Tourist Board ‘National Accessible Award’ – Mobility: Level 1. The ETB Hotel Inspectorate were then bought over by Group 4 Security (I kid you not! ), so I resigned from this increasingly expensive system in 2012. Now I ensure that all the previous facilities are still available, as well as spending the money saved on maintaining the high standards eg new carpets throughout, Free WiFi, Freesat TV, new duvets, etc. Weekly rental prices start at £392, which includes all of the above. Click here for Special Offers on Late Bookings – Save up to 25%! Arrival time is normally after 3 pm on Fridays | Departure is by 10 am.